Black Ice Software - Speed Up Software Distribution! 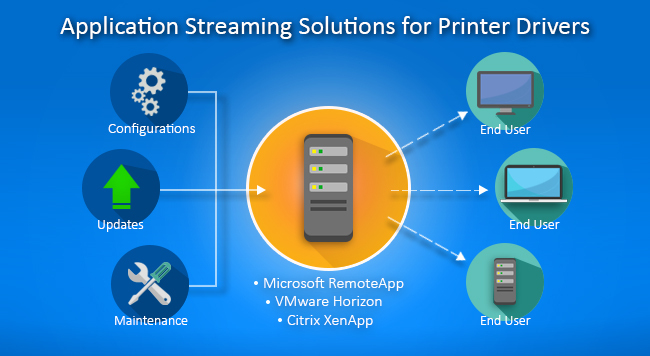 Application Streaming is now supported with the Black Ice Printer Driver, over every popular app stream solution, including Citrix XenApp, Microsoft RemoteApp and VMWare Horizon. By streaming the Black Ice Printer Driver over the network, Administrators and System Integrators can easily manage, maintain and upgrade and configure the Printer Drivers, without having to access dozens of end-user desktops separately. The Black Ice Printer Drivers fully support VDI technology (Virtual Desktop Infrastructure) when the users are accessing a virtual desktop from a datacenter. Application streaming is a form of on-demand software distribution. In these scenarios, the application only has to be installed on a centralized computer or master image: while the end user performs actions in the application, the necessary code and files are delivered over the network as and when they are required. One of the challenging aspects of VDI (Virtual Desktop Infrastructure) is licensing and deployment. Black Ice Software provides a reliable easy to use special licensing mechanism for deploying Black Ice products on VDI environments. Administrators can speed up the software installation and updates while saving time and money. For more technical details about application streaming solutions for Black Ice products, please contact sales@blackice.com.